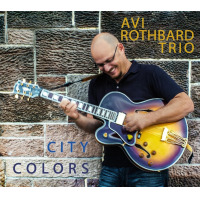 Guitarist Avi Rothbard, born in Israel and, since 1999, a mover and shaker in New York City, enjoys a distinguished career as a jazz performer and clinician. Sadly, his time in the studio has been intermittent at best. City Colors, his third leader date in 15 years, is his fullest résumé on record. Rothbard is a multifaceted player who is comfortable across a spectrum of genres, handling each with equal respect. Gerry Rafferty's "Baker Street" begins the proceedings with a lushness that is remarkable for a guitar trio. Bassist Vicente Archer and drummer Darrell Green swing organically throughout, unafraid to shift things obliquely whenever the mood so requires. Rothbard tells a story in the first few strums, and from those unravels a convincing plot. His soloing, too, has a narrative quality to it that shows a musician who approaches his out-loud thinking with care. He also excels at the understated swing with which he pulls off Tony Williams's "Lawra." This tune's negative spaces and occasional leaps make it an instructive example of keeping your ego in checksomething not so easy to do when caught in the groove. But Rothbard plants his feet firmly in the theme and opts for branches over wings. Jerry Lordan's popular "Apache," more than ever, feels like something out of a Quentin Tarantino love story. Rothbard handles its harmonies with surety, sidewinding his way across barren lands where no boots have tread except for those of the lone cowboy who knows he is outnumbered. It is a tumbleweed untangled and laid end to end toward a blazing horizon. Another of Rothbard's talents is arranging popular songs, and in this case "Bennie and the Jets" fits the bill and then some. The guitarist cites Elton John as his first true musical idol, and it shows in the present rendition, which sands the rougher edges of the original in ways that make the familiar new again. Yet the album's heart lies in Rothbard's originals, all of which are three-dimensional and well-dressed. While "Smoke Screen" also draws on the popular canon (in this case Deep Purple's "Smoke on the Water"), his writing stands out for its structural integrity. Between the funkier propulsions of "Before Noon Comes" and the soulful affection of "Maya's Waltz" (dedicated to his daughter), melodies and modes reveal the true breadth of his playing. "See Walk" is the album's kingly highlight for showing a bandleader who isn't afraid to unleash his creativity in poetry rather than prose. Rothbard owns this one from beginning to end, but always with a sensitivity that commands even as it soothes. Track Listing: Baker Street; Before Noon Comes; Lawra; Maya’s Waltz; Apache; Bennie and the Jets; See Walk; Smoke Screen. 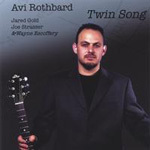 Personnel: Avi Rothbard: guitar; Vicente Archer: bass; Darrell Green: drums.